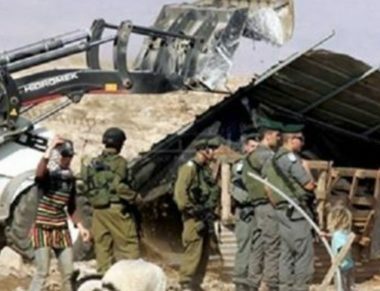 Israeli soldiers invaded, Sunday, a Palestinian land near the al-‘Arroub refugee camp, north of the southern West Bank city of Hebron, uprooted dozens of trees, and demolished a chicken coop. Local nonviolent activist, Mohammad Awad, said the soldiers, and employees of the so-called “Civil Administration Office,” the executive branch of Israel’s illegal occupation of the West Bank, invaded Abu Souda area, on the Hebron-Jerusalem road, right near the refugee camp. He added that the soldiers then uprooted dozens of trees, and demolished a 600 square/meters chicken coop, owned by a Palestinian, identified as Khaled Mohammad Samaheen. The attacked land and coop are in front Beit al-Bakara, meaning “House of Blessing”, built 70 years ago, is a 38-dunam (9.5-acre) church compound located on the main road between Bethlehem and Hebron, opposite to Arroub refugee camp. It used to serve as a hospital providing free treatment to people suffering from tuberculosis until it was shut down in 1983. Jewish settlers later bought the compound from the church, through a fake company.